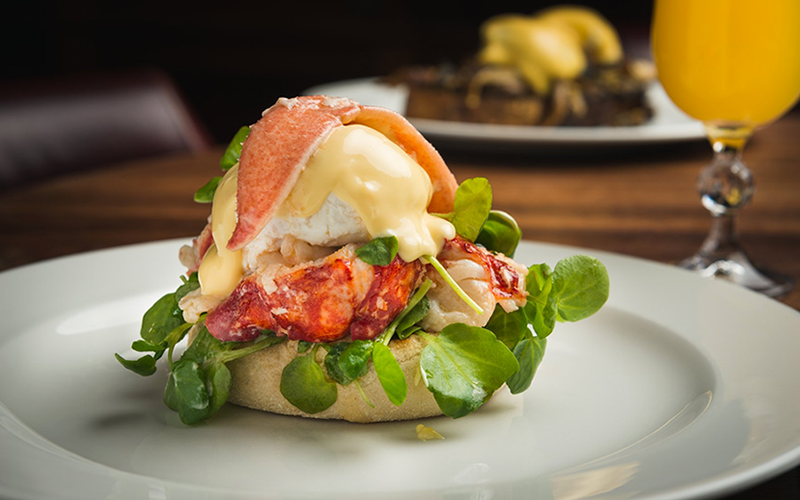 If you can get past the idea of going to Hawksmoor and not ordering something meaty, then we can highly recommend their lobster Benedict. It’s seriously decadent and pairs beautifully with their Marmalade Cocktail – a blend of gin, Campari, lemon juice, orange bitters, and English marmalade. Gin and lobster for breakfast – we like to think this is how the Queen starts her day. There’s so much to love at Aquavit, from its sleek design to its modern Nordic menu. If you book for brunch, you can look forward to dishes like hot smoked salmon, Swedish pancakes, and raggmunk (potato pancakes) with bacon and lingonberries. 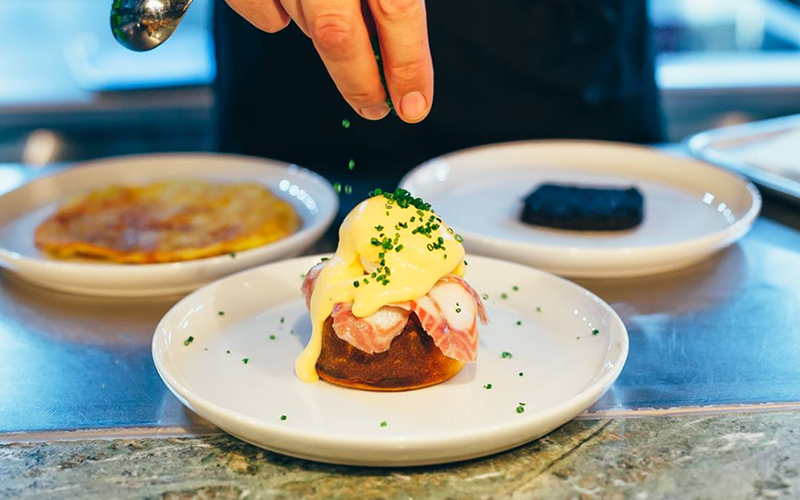 For us, the star of the show is their smoked eel Benedict which manages to feel indulgent but good for you at the same time. Did we mention you can upgrade to unlimited wine for £15? Highly recommended. Brunch in Chelsea is already a pretty posh affair, but this British brasserie goes the extra mile. They use Cacklebean eggs (laid by posh chickens in the Cotswolds) and Parma ham in their Benedict, and you can add truffle for an extra £3. Pair it with a glass of fizz and a post-brunch stroll along the King’s Road for the ultimate weekend treat. 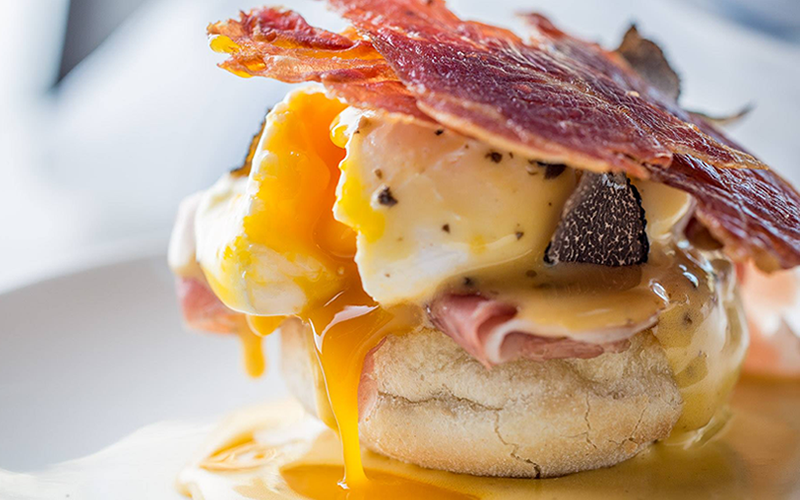 At Bankside brunch spot The Table Café, they’ve traded muffin for bagel and created The Stack – a toasted bagel tower piled high with ham hock and chorizo, baked beans, poached eggs and hollandaise sauce. Come hungry! At HotBox, you can start your day with all manner of meaty treats, from steak and eggs to their famous short rib tacos. If you’re all about the eggs, get the Benedict. It comes with thick slices of smoked pork belly and a spiced hollandaise you’ll be dreaming about for days after. 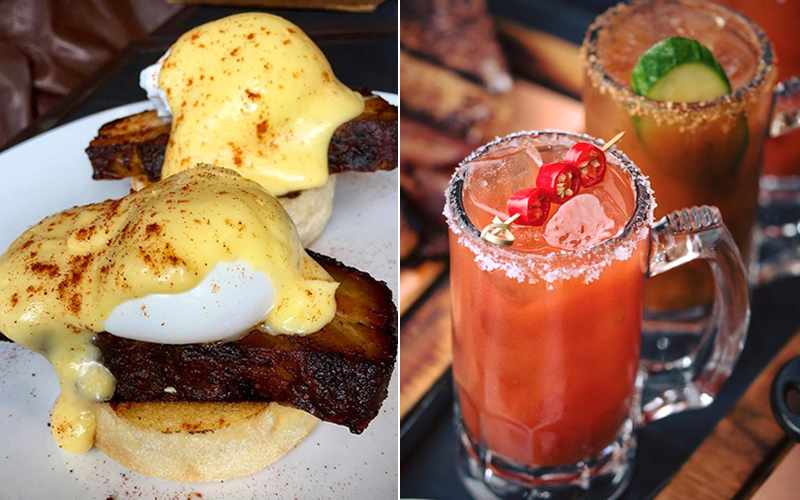 Their Bloody Marys are pretty perfect too, so why not go bottomless for an extra £25? If you live in Earlsfield or Clapham Junction, you’re probably already familiar with the Ben’s Canteen brunch menu. 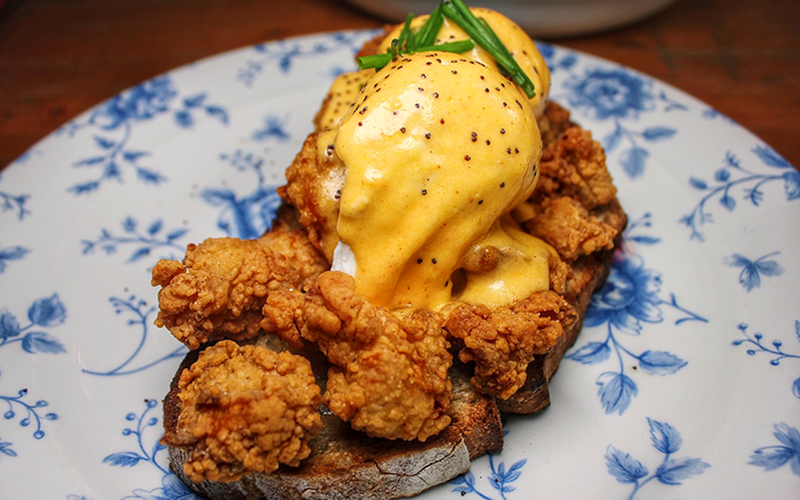 They serve their eggs Benedict with fried chicken that’s perfectly crisp on the outside and juicy within – perfect if you’re hungover, or just greedy. There’s also a less sinful Green Benny on offer, with roast tenderstem broccoli, cavolo nero, and a tahini-tumeric dressing. 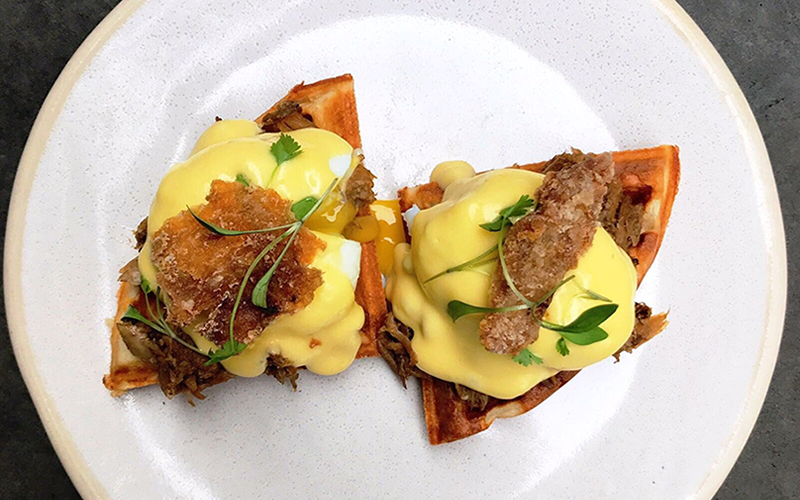 Duck & Waffle’s casual offspring near Piccadilly Circus is open all day serving duck-led dishes, small plates, cocktails, and brunch. If you can resist the famous duck and waffle, the braised duck Beni is delicious – who can resist crispy duck skin? Best of all, they serve brunch every day until 4pm so you can spend an extra few hours in bed. 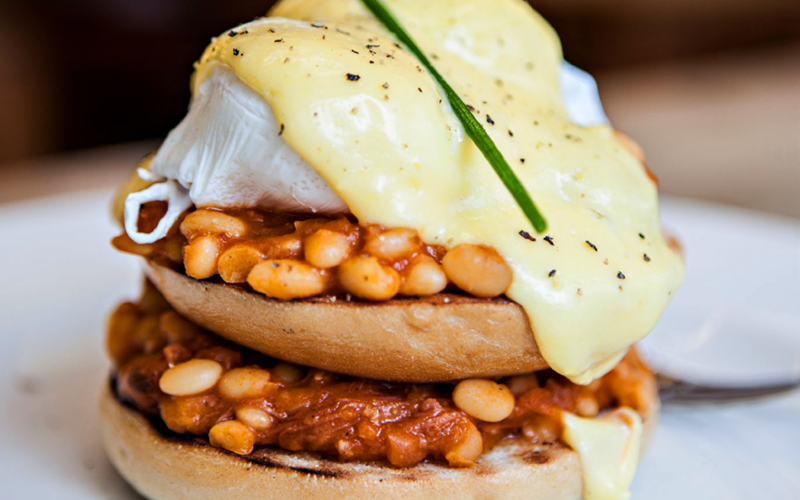 Introducing one of London’s most controversial Benedicts – the burgerdict. 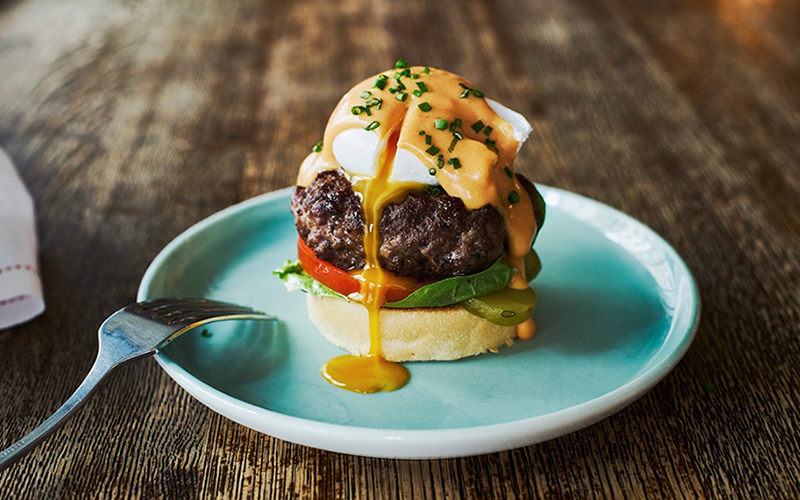 All the key elements are there – the muffin, poached egg, and superb hollandaise – but instead of ham there’s a dry-aged beef patty. You can add crispy bacon, too. Genius or a step too far? You’ll have to try it for yourself – it’s on the brunch menu at Rail House Café in Victoria and their Fitzrovia sister, Riding House Café. We’re not even sure this one qualifies as a Benedict, but it’s too delicious to leave out. 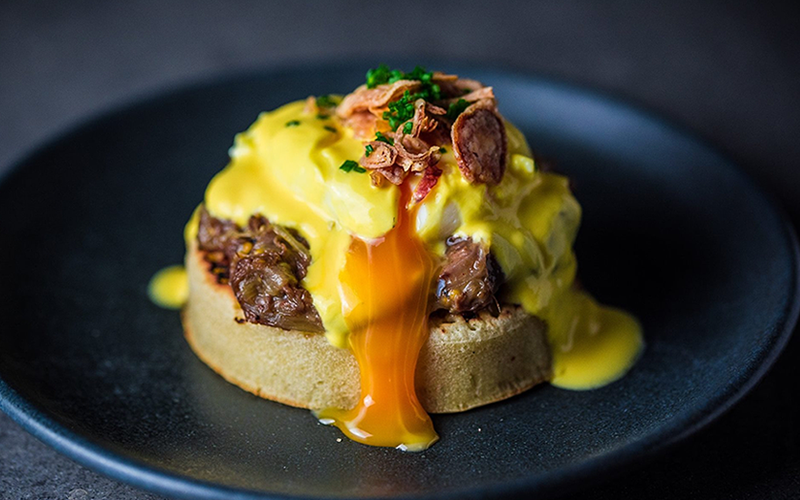 Alongside their French toast and brunch tacos, Dirty Bones serves a hangover-busting dish of slow-cooked short rib, poached eggs, hollandaise, and caramelised shallots on two toasted crumpets. It tastes even better than it sounds and you probably won’t need to eat again until dinner. Try it for yourself at their restaurants in Shoreditch and Kensington.